Warm Omaha weekends will always include a trip to either the Old Market or Aksarben Farmer’s Market. Strolling along the stands, meeting old and new friends, and finding fun ways to use unfamiliar produce is all part of the sweetest summer memories for me. In addition to the superior flavor of sun-ripened heirloom food, it is an adventure to learn more about the people responsible for growing and nurturing the food that nurtures you. Learning that the purchase of local tomatoes directly funds a child’s ballet lessons, pays health insurance for the farmer’s families, and ensures next season’s crop, makes salad so much more gratifying! This month, The Reader would like to introduce you to a few of the producers you will meet at this year’s Farmer’s Market. Laura Chisholm wakes early every day to tend to the cows lazily grazing out in the pasture of the family farm just this side of Lincoln. Nestled on 160 acres, the Chisholm’s property is home to a herd of Jersey cows which consume legumes, clover, and native grasses, resulting in a nutrient dense, certified natural, rich milk product. The flavor and consistency of their dairy items are the byproduct of healthy, low stress cows. Laura dons a hairnet and a dynamite pair of dimples as she slaves over large pots, concocting cheeses for the family’s other venture, Orchard Hill Creamery. She chats as she hand cuts and marinates cheese, churns fresh ingredients into her ice cream, and carefully crafts and cultures yogurts to sell online and at their country store, which is open from 10-4 on weekends. In addition to their dairy items, the store sells Up-cycled items, natural skincare, bath products, healing salves, Young Living Essential Oils, crafts, art, and more. On a 34 acre vegetable farm in Lincoln, Charuth (Charlotte Ruth) Loth cuddles close to her kids. Her smile beams as she lovingly strokes the back of one, as another hops up onto her knee and gently headbutts her. It’s easy to believe that love is the secret ingredient to the delicious goat’s milk products they sell under the Dutch Girl Creamery Artisan Cheese label. 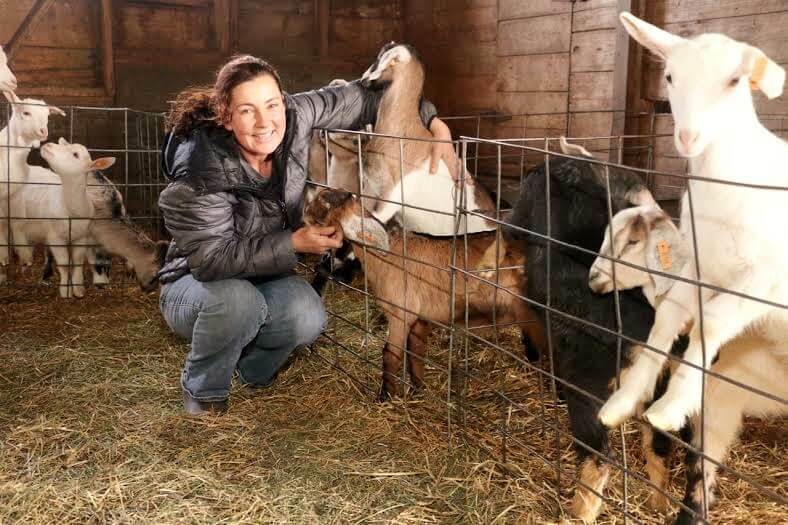 12 of their 34 acres are dedicated to growing alfalfa for their precious goats, who graze happily and produce a superior product under the care of the Loth family. Certified Organic from 1998 until this year, when late paperwork was tantamount to a lost certification, the Loth family maintain the same procedures as they did in years when they were successfully certified. 100% non-gmo, the family uses only natural methods for growing and producing their exceptional wares. Gene Sivard has a relationship with the soil where he plants green onions, kale, kohlrabi, corn, cabbage, and whatever else turns him on at the moment. A trip to his Louisville farm will find the gregarious man on his knees, literally thumbs deep in dirt. He connects with his land like it’s family, and the lush fields of green are testament to this level of devotion. A trip with the family to pick radishes in the spring, broccoli in the summer, or pumpkins in the fall will give you a new sense of appreciation for the love and labor that brings your tomatoes to your table. Located on 150 acres in Honeycreek, Iowa, Grandpa’s is the epitome of family farming. Children rest against giant, wooly Katahdin sheep as they laze in the warm afternoon sun. Strong women in muddy jeans and strapping men in flannel walk the vast property, tending the flock. Cows graze peacefully as chickens roam the property like it belongs to them. A lamb born early is not left in the barn to fight for its life, it’s brought into the family’s home for bottle feedings and the tlc it needs to pull through. When you patronize Grandpa’s, you’re treated almost as well as their beloved animals, and it’s enough to feel like a member of the family. When you think of a successful farm, acres of lush green surely spring to mind. Urban Farmer Gary Sheller bucks this trend with his local (read: just down the street) growing operation. The self-proclaimed “old hippie” grows his wares in a Mylar hothouse he built himself on 16th and N st. His long white beard blows in the breeze as he quietly focuses on the tender seedlings in his homemade greenhouse. Friendly and relaxed, Sheller proves that getting back to the roots of the matter doesn’t have to be a gargantuan undertaking. Ask the owners of Le Bouillon, Dante, Grey Plume, La Buvette, Boiler Room, Kitchen Table, Over Easy, V.Mertz and Localmotive about their successes and they will instantly credit the quality of their ingredients. With 35 varieties of heirloom and organic vegetables to supply these amazing eateries, Matt and Terra Hall remain humble about their incredible contribution to the Omaha food scene. Their focus is on healing the land and healing bodies through clean practices and clean products. Beyond your standard farm fare, the Halls have visions of fruit trees, chickens, ducks, berries, beehives, and much more. Their model includes nurturing and building the soil, crop rotation and diversity, and educating others about sustainable and organic farming practices. A visit to the farm may find the adorable couple spreading fertilizer by hand, a Terra-powered tilling machine, and the two basking in the beauty of their silent partner. Located in beautiful Loess Hills in Missouri Valley, Iowa, the Halls have planted roots and are ready to see a real-food revolution take place. Known widely for their generous food donations to worthy causes, the Andersons of Melia Valley Gardens are fond of getting their hands dirty. Matt and Linda have spent the last 19 years focusing on their produce grown just north of Highway 6 on 234th st. The handsome couple use their free time seeking more opportunities to serve their community, and lace all of their actions, from digging dirt to preparing a meal at a local church, with deep love for feeding their neighbors. Melia Valley Gardens at 15101 South 234th St. When you shop at any of Omaha’s incredible Farmer’s Markets, join a CSA, or order from any of the vendors online, you’re not buying some CEO a 4th yacht to name after his 4th wife, or fueling a private jet whose owner pays his pickers slave wages. You’re buying sustainability, health, and you’re keeping the lights on for a family who only wants to bring you the best.